What to Do with Puppy While at Work on a Full Time Job - It's not Impossible! 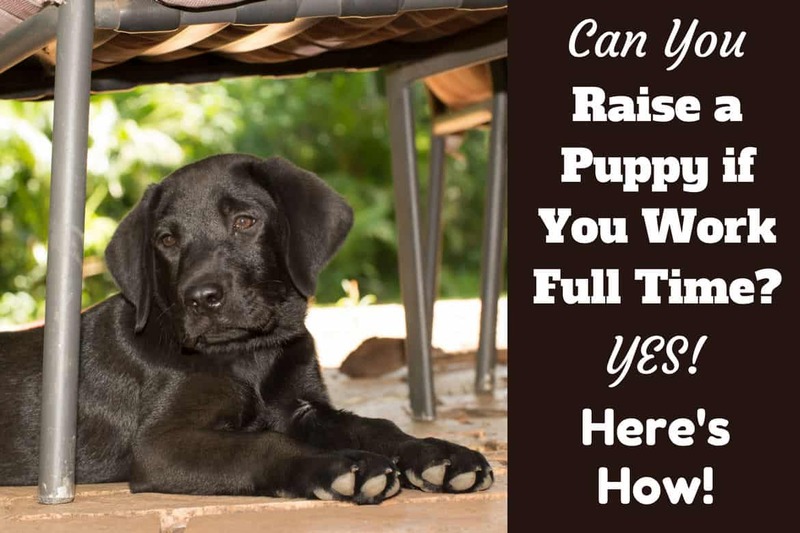 Home PUPPIES	How to Raise a Puppy if You Work a Full Time Job – It’s not Impossible! What to do with puppy while at work or on a full time job? No one can deny that raising a puppy while working full time is hard work. You need time, energy, commitment and, of course, love, in order to give your Lab puppy all they need for the best start in life. Some people preach that you won’t have the time to properly look after a puppy if you work full time, and that to buy a dog in those circumstances is ‘selfish’. We disagree, and personally know plenty of full-time workers that have raised healthy and happy puppies despite not being able to spend all their time at home. 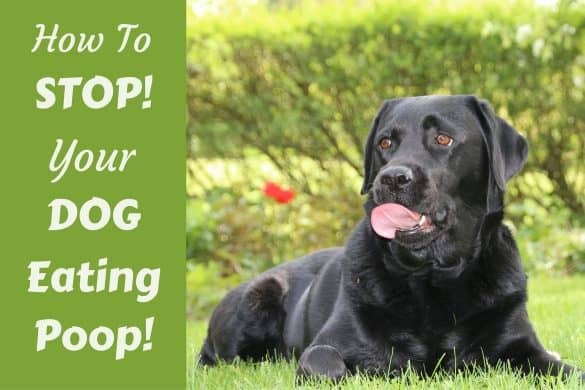 Of course, it can be challenging and you will need to be committed to make other sacrifices and compromises for your new pup — but it definitely can be done. 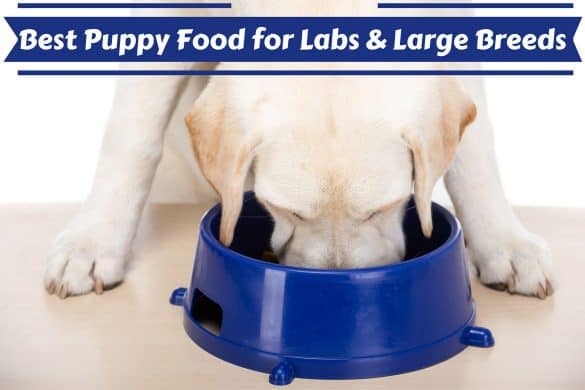 In this detailed guide on how to raise a labrador puppy if you work full time, we’ll guide you through the various challenges of raising a pup and how you can best equip yourself to overcome any issues if you work full time and can’t ‘be there’ all hours. Regardless of whether you work full time in an office, work from home or are unemployed, raising a puppy can be hard work. By their nature, puppies need a little more care and attention than older dogs to make sure they develop correctly, don’t get lonely and don’t mature with any behavioral problems. Here are a few issues that most new puppy owners are concerned with, and the major challenges you’ll most likely face if you’re working full time. Just like with human children, puppies are prone to ‘little accidents’ when they’re very young. Their bladders are much smaller than adult dogs and they often won’t be able to hold in their urine if they’re left for more than an hour at a time. Obviously, for full-time workers, it’s simply not practical to come home every hour or so to let your dog out into the garden to relieve themselves. It can also be a strain on family and friends to pop in so often throughout the day. 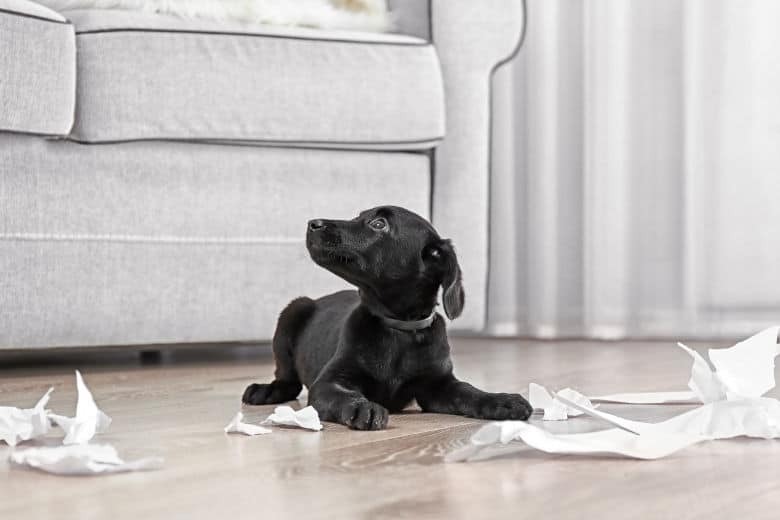 One way that most new puppy owners manage this problem is by paper training or using puppy pads that absorb the mess and odor when your pup goes to the toilet. While puppy pads are very useful for containing those inevitable little messes in the first few months of your puppy’s life, you don’t want your dog to develop a habit of using them to go to the toilet instead of waiting until they’re let outside. The best way to avoid this is to make sure that someone can pop in on your dog every few hours or so to take them outside. This way, the puppy pads are simply a back-up to their regular toilet training. You’ll find that somewhere between the 12 to 24-week mark, your puppy should be able to hold their bladder for around 3 to 4 hours. At this point, you should be able to do away with the puppy pads and just have someone drop in once or twice during the day. It’s imperative that you spend lots of time with your puppy when you first bring them home to ensure that you properly bond and that they feel comfortable in their new home. Most new owners opt to take a week or so off from work so they can settle their pup into their new surroundings. Of course, most of us at some point will have to go back to work — it’s simply not practical to take six months off to fully train and assimilate a new puppy! It may be difficult, however, for your dog to go from having you around 24/7 to just in the mornings and evenings. Aside from potentially wrecking your home, a puppy suffering from separation anxiety can cause problems with your neighbors as well! The best way to avoid separation anxiety with your Lab puppy is to introduce them to ‘alone time’ gradually, so they don’t go from enjoying 24/7 attention straight to being left alone for 7 hours at a time. Accessories like chew toys, familiar blankets, and even pet monitors can also make the transition easier for your pup — we’ll cover all of these later. Another worry for dog owners that work full time is that they won’t have enough time to train their new puppy. Actually, training puppies is something that’s done little and often, rather than intensely over the course of the day — young pups simply don’t have the attention and focus for that sort of mental workout! Being at work for most of the day doesn’t have to disrupt their training schedule but, you need to commit to short and sweet bursts of training when you are at home. That means 5 minutes of training in the morning before work, 5 minutes when you come home for lunch and another 5 or 10 minutes in the evening once you’re home for the day. Exactly how much and how often you train is up to you: the most important thing is that you keep it consistent. 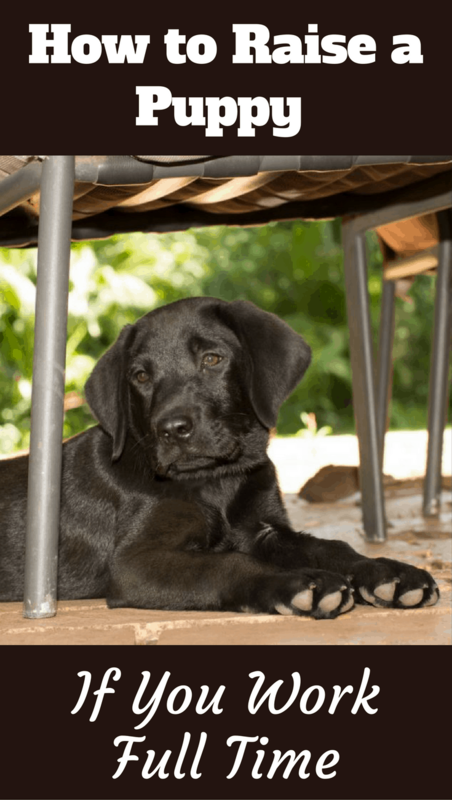 Now that we’ve covered the challenges of raising a Lab puppy when you’re out all day, let’s discuss the ways to manage those challenges. Let’s be clear: although it’s perfectly possible to raise a puppy while you’re working full time, it’s also hard work. 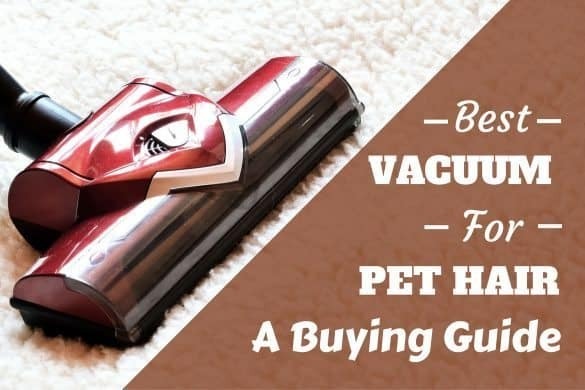 You’ll need to compromise on a few issues (like using puppy pads instead of taking your dog outside every hour) and you will need to spend lots of the time you do have at home looking after and caring for your new puppy. 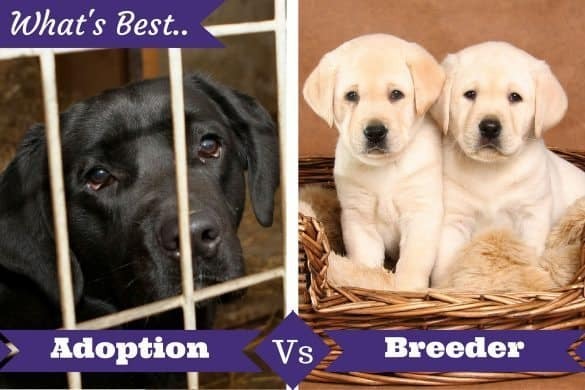 If you don’t want to commit to spending money on dog sitters, ask family or friends to visit when you’re out, or spend time training and playing with them when you are together, you may need to accept you’re not ready for a new puppy right now. But, if you’re ready for the challenge and commitment, go for it! The best way to ensure that you’re raising a healthy and happy puppy is to get them into a set routine. This essentially boils down to them doing the same things every day, at the same times, with only a little variation. Make sure that they’re fed at the same times every day, trained at the same time every day, that the same person pops in to see them at the same time every day and that they are taken outside for toilet breaks at regular intervals. Dogs are clever animals and most Lab puppies will quickly ease into a new routine that they can predict and perform for. It should go without saying that potty training will be much quicker and easier if you adhere to the same routine day in and day out, for instance. One of the first things to learn when you try to raise a puppy while you’re working full time is that you can’t do it alone. Your dog will need lots of attention for the first few months of their life and simply can’t be left alone for the whole day. Some people have very supportive families who live nearby who can pop in a few times over the work day and make sure that your pup is doing well. If not family, you could ask a helpful neighbor or even hire some help in the form of a dog sitter. A few dog owners will use a ‘doggy day care’ center for their puppy before picking them up on their way home from work. Although this sort of service obviously costs money, you’ll be safe in the knowledge that your new Lab pup is being well looked after and continually monitored during your time away. Doggy day care isn’t only good for brand new puppies: some owners who work full time also choose it if their dog suffers from separation anxiety, regardless of how old they are. Most cities and large towns will also have a supply of professional dog walkers, who will come and pick up your puppy during the day and take them out with the other dogs in their retinue for a long walk to stretch their legs while you’re at work. Using a professional dog walker is a great way to ensure that your new puppy not only gets to go to the toilet outside while you’re at work, but also that they get some much needed daily exercise in — very important for Labradors. How Often Should My Puppy Be Checked On? How often you should get someone to pop in on your Lab puppy will vary from dog to dog and you’ll quickly get a feel for what works for your circumstances. When you first bring your dog home, you should try to take leave from work for a week as you settle your puppy into your home and get to know your new canine companion. You should spend as much time as possible with them in the first few weeks. Between 10 and 12 weeks of age, your puppy should have a little more bladder control and should be more secure to spend a little more time alone. At this point, you can either arrange for a dog sitter, doggy day care or for a helpful neighbor to drop in during the mid-morning, at lunchtime and in the mid-afternoon. You may be able to come home at lunchtime to ease the burden if you work nearby. Once they get to the 3 to 6-month-old stage, your pup should be more or less settled into their new life at your home and will require less frequent toileting. Most owners at this point will come home at lunchtime, or arrange for someone nearby to check in on them instead. If you’ve been crate training your pup, they should be happy to stay in their crate for up to four hours a day at this point. Some experts say that you can guess how long your dog can hold their bladder for by multiplying their age in months by 1 hour. So, a two-month-old puppy will need to pee every two hours or so, a three-month-old puppy every three hours, and so on. Of course, this only works for the first few months of a dog’s life — up to around 4 or 5 months — and it will depend on other factors too. Speaking of crates, many dog owners find it useful to keep their pup in their crate when they’re out during the day. If properly trained, dogs will enjoy spending time in their crates and won’t go to the toilet while they’re in them. Crating your dog while you work also means that there’s no risk of you coming home to chewed up furniture! But if you think you can simply put your brand new puppy in a crate in the morning, waltz off to work and then come back 8 hours later to a happy pup, you’ll be in for a rude awakening. Puppies need to be crate trained gradually for them to get used to the new environment and to see it as their den. They certainly shouldn’t be left in there for more than 4 hours at a time even when they are trained. The best way to start crate training is to do it while you’re at home and not while you’re at work. Introduce your dog to the crate by leaving the door open and putting their favorite toy or a treat at the entrance to the crate. You should do this a few times until your dog is happy to sit and play in their crate without too much prompting from you. At this stage, you can start closing the crate door but, again, only for a few minutes at a time at first. Some dogs might start howling at this point — you should simply wait until their howling stops, count for 30 seconds, then open the door to let them out. You can keep increasing the time they spend with the door shut as they become more used to the experience. Once your puppy is spending significant periods of time in the crate with the door closed while you’re at home, you can start trialing the crate training when you’re out of the house. Again, you’ll need to start slowly and increase the time you spend away from them gradually. Firstly, put your dog in the crate and then step outside the front door. Count for 30 seconds and then reenter the house. Every day, you should increase the amount of time you spend outside the house until your dog is comfortable with the arrangement. Then you can stay away for an hour at a time until eventually, you can stay out of the house for four hours at a time with your puppy still happy. You shouldn’t crate a dog for more than four hours at a time. Other than the fact that your puppy will likely want to stretch their legs and have a run around for a bit, they will need to go to the toilet at this point, and it’s best to avoid them peeing in their crates if possible. Not everyone likes keeping their puppy in a crate while they’re out of the house. If you want your new pup to have more room to move around while still not given access to your entire house, you may want to consider getting a playpen. Playpens are just as secure as crates but much bigger, while still having something of a ‘den’ feel that our canine companions love so much. Make sure that you buy a pen big enough for your dog to stand up and walk around in. Unlike a crate, it’s likely that your Lab puppy will go to the toilet in a playpen — especially if they’re being left alone for multiple hours. Whereas dogs don’t like going to the toilet in their crates because that’s also where they sleep, a playpen will allow them enough room to designate part of the pen for sleeping and another part for going to the toilet. It’s best to lay down some puppy pads in this case, to make sure that any mess is contained as much as possible. Other dog owners who work full-time dedicate a small room in their homes for their Lab puppy to stay. This gives your dog some much-needed space of their own, while also restricts their access to the rest of the house. You can make the room as puppy friendly as possible, with comfortable beds, blankets, chew toys, water and puppy pads. Make sure that there’s nothing in there that you mind losing to a teething puppy! As we discussed earlier, one of the major concerns for full-time workers raising puppies is the fact they could suffer from separation anxiety. 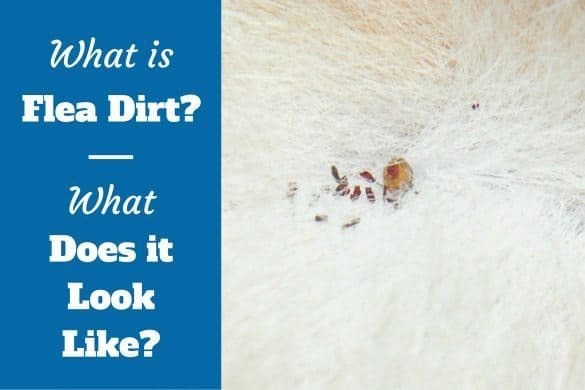 Not only is this a problem for you and your dog, but it could also cause problems for your neighbors, especially if they are in hearing distance of any howling. The key is to expose your puppy to isolation only very gradually and to ensure that the difference between their environment when you’re at home and when you’re out isn’t too stark. Canine behavioral experts recommend that you don’t create a ‘Jekyll and Hyde’ environment for your dog — that is, don’t smother them with love and attention when you’re at home, only for them to have no human interaction with you or anybody else during the day. You should encourage your puppy to enjoy their own space, whether that’s by crate training them or providing them with plenty of toys and other stimulation while they’re on their own. Someone popping in every few hours will also lessen any anxiety they may feel on their own too. Aside from toys and a crate, some owners like to use a dog monitor while they’re away from home, that allows them to communicate with their dog from their workplace. These devices often have a webcam and a microphone that you can use to call your dog and show your face on the screen to them. Particularly high-tech models even allow you to remotely dispense treats for them too — you could even fit in a few short and sweet training opportunities while you’re at work with this technology! Some dogs need some white noise or even the background sounds of the radio to stop them from feeling lonely. You’ll quickly work out what works best for your dog (and your neighbors should tell you if they’re particularly prone to barking throughout the day). Once your Lab puppy gets used to being left at home alone for much of the day, it’s likely that they’ll spend much of that time asleep, even if you do leave them with plenty of chew toys! While that means they shouldn’t cause any problems with the neighbors, you will need to make an extra effort to ensure that they get enough exercise to avoid them becoming overweight or bored. How you wish to tackle this is up to you: some full-time workers prefer to use a professional dog walker to ensure that their puppies get the requisite amount of exercise they need, while other owners simply commit to early morning and evening walks every day with their dog. When it comes to training, again consistency is key. Commit to at least two sessions of 5 minutes every day of training — once before you go to work and once when you get home — for the best results. Training new puppies is also a great way to reinforce your dog’s routine and will keep them from getting bored and experiencing separation anxiety. It’s always best to have a few tools in your arsenal when you’re raising a puppy, to make sure that their days are as engaging and stimulating as possible. First things first, you need to think about where your dog will stay when you’re at work. Will you give them full reign of the house? Or will you restrict their movements in a crate, play pen or in a small room of the house? You may choose to send them to a doggy day care service instead. Next, make sure that they’re equipped with the accessories they need to enjoy their own company and solitude while they’re alone. A selection of chew toys is always a good place to start, and many owners choose toys from brands like Kong which also provide your puppy with a degree of physical and mental challenge while they’re on their own. You can stuff these toys with some treats, kibble or even peanut butter, and your dog will have to work to get out the food: some owners say these toys keep their pups entertained for hours! Make sure that you only buy safe toys that can’t be shredded by your Lab puppy’s gnawing jaws. Labradors are notorious chewers and chew toys can pose a safety hazard when pulled apart. Soft blankets and a high-quality dog bed are also a good purchase and will help your dog to enjoy their space and perhaps even encourage them to sleep while you’re out of the house. And, of course, don’t forget some puppy pads to contain any little messes your new dog might experience during their first few months. 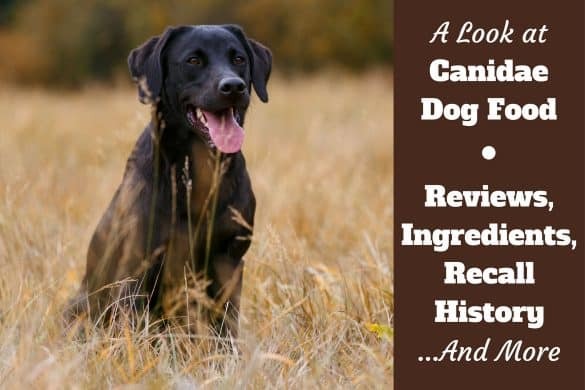 Hopefully, you can see that with a little work, commitment, and extra help, it’s perfectly possible to raise a healthy Labrador puppy when you work full time. Remember: compromise and consistency is key!